Over the last six months or so I did some research on picks that would suit me and my playing best. I feel most comfortable with triangular shapes and I am going for a fat/beefy/warm/dark sound with a minimum of string-noise (both with and without the amp). These are factors that brought down the number of possibilities quite a bit. 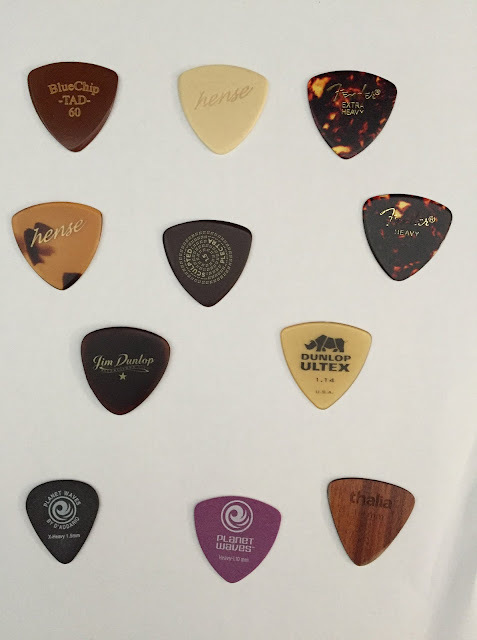 It is very interesting to hear the differences between picks and for me it was a great learning experience as it is absolutely important to explore the pick as a vital part of one´s sound. Below you will find an overview of what I spent my money on. These "standard" inexpensive picks are available from several companies and I have used them for a long time. Obviously the extra heavies sound darker and therefore I prefer them. 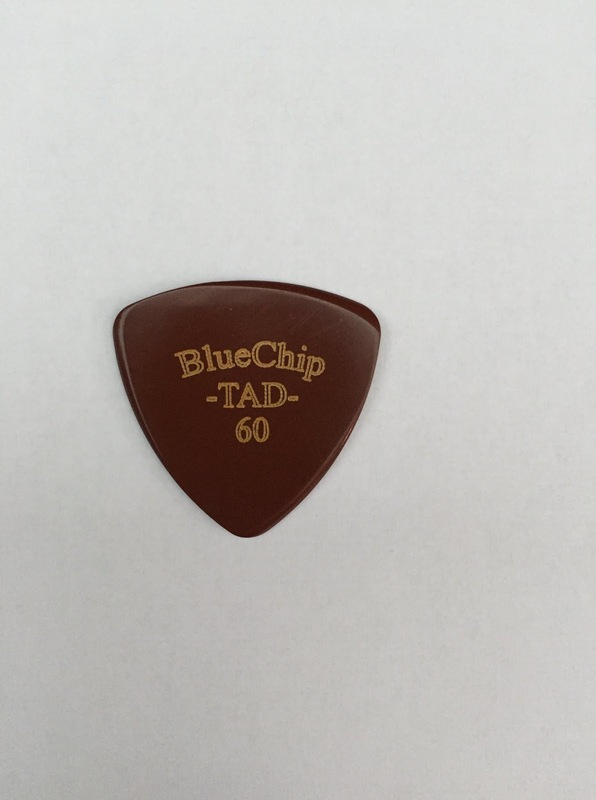 You can make them sound even better by using extra fine sandpaper to bevel the side where the pick meets the string - a process which happens more or less automatically when you play a pick over a longer period. Repeat this procedure from time to time to keep the surface smooth. 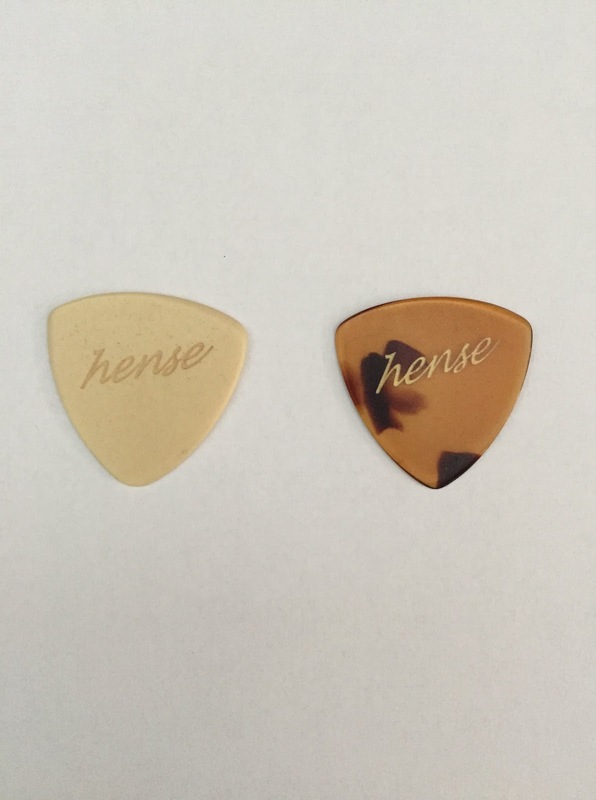 These picks from Germany are pretty expensive (19,90 € each), but really worth a try. The sound of both goes in the direction that I was looking for (dark, warm, beefy), with a minimum of click-noise. Both have beveled and polished sides, which is always nice to begin with. The Cream Speedy is one of my favorite picks on my semi-acoustic guitar - to me the sound has a certain amount of "dirtyness" that I like on that guitar. After playing it for several weeks I realised that the material wore off a little bit, but after some sanding the pick was smooth again. 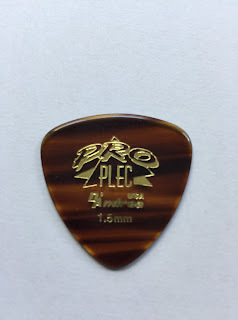 The Happy Turtle Pick is advertised to have the sound and feel of classic turtle picks. However, the special material (in German it is called "Milchstein") is not 100% even, which kind of distracted me, but fortunately one of the three sides felt ok. 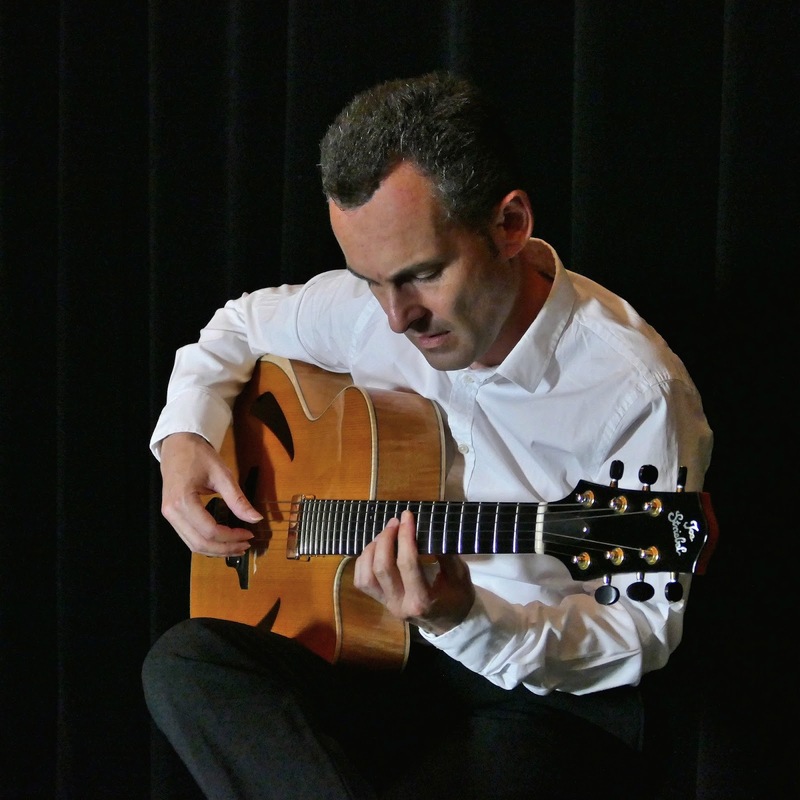 The sound is very good on electric, archtop and nylon-stringed guitars. To avoid unwanted warps, see to it that the pick does not get wet. To conclude, I do not regret spending that kind of money for a piece of plastic, but now I always do double-check my floor before vacuum cleaning! The 3,0mm Large Tri-Flatpick (the left one in the picture) is obviously pretty thick. 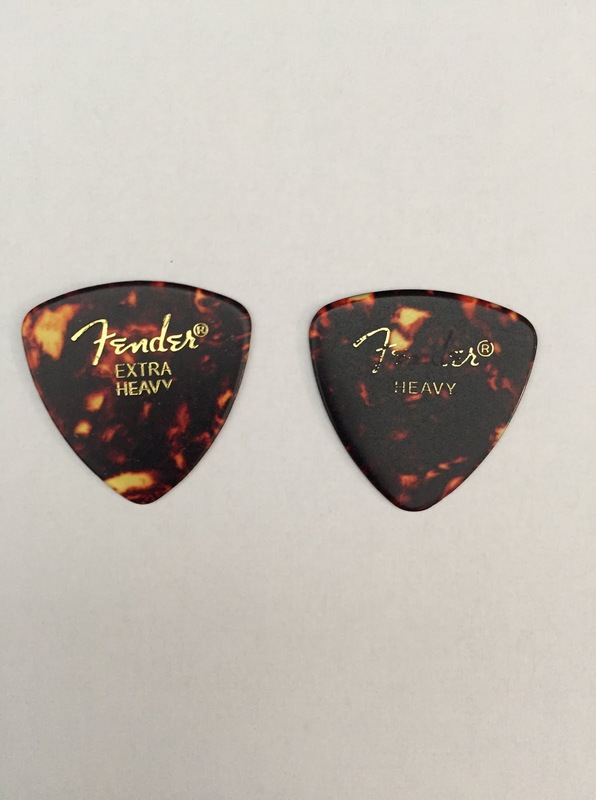 If you can handle that, it gives you a really dark, warm sound (the darkest out of all the picks I checked out). I was surprised that it works best on my nylon-string guitar! Especially when playing chords, there is more click noise than with other picks (and it certainly depends on the guitar and the strings you play) - some guitarists might even like this and call it a "percussive quality". 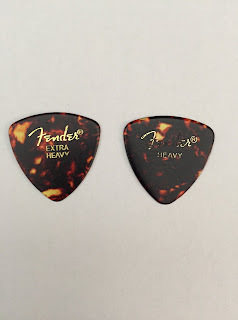 It´s quite inexpensive: 8,65 € for a pack of 3 picks. 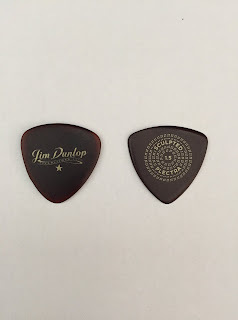 The Dunlop 1.50 Primetone Triangle Pick has turned out to be one of the favorite picks for me. 10,24€ for a pack of three is a very modest price for a hand beveled pick that sounds just the way I like it on each of my guitars! For me the quality is at least on the same level with picks that are much more expensive (like the Hense picks and the Blue Chip pick which you can read about below. Try it! 1. This was before any punitive custom tariff had been imposed against US products. Nevertheless, this 1,5mm pick sounds very good on all my guitars. As advertised, the material does not wear out and the beveled sides do not have to be polished - my pick looks exactly the same after several months! The sound is pretty close to the Dunlop Primetone 1,5mm which is much more inexpensive - not better or worse, just a little bit different. That is the reason why I probably would hesitate to buy it again - it is simply way too expensive. But as it is I am glad to have it. 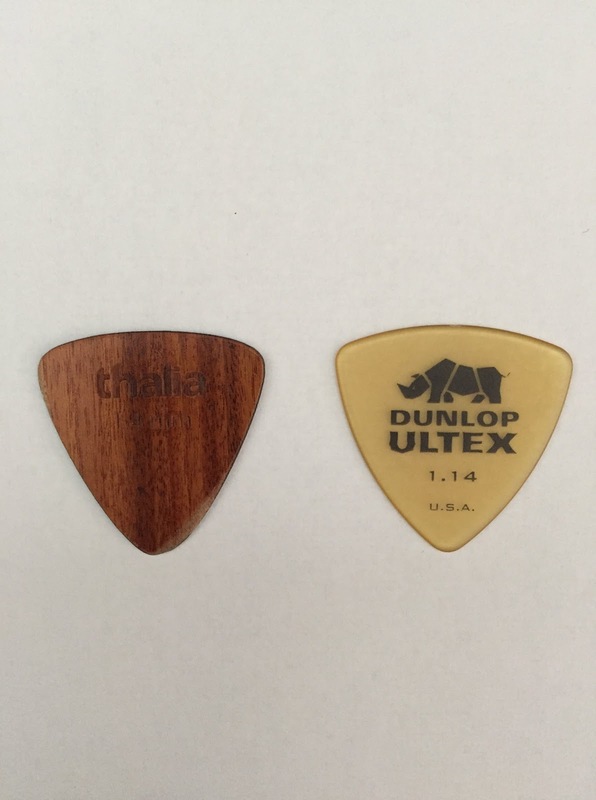 Here are two picks made of Duralin. 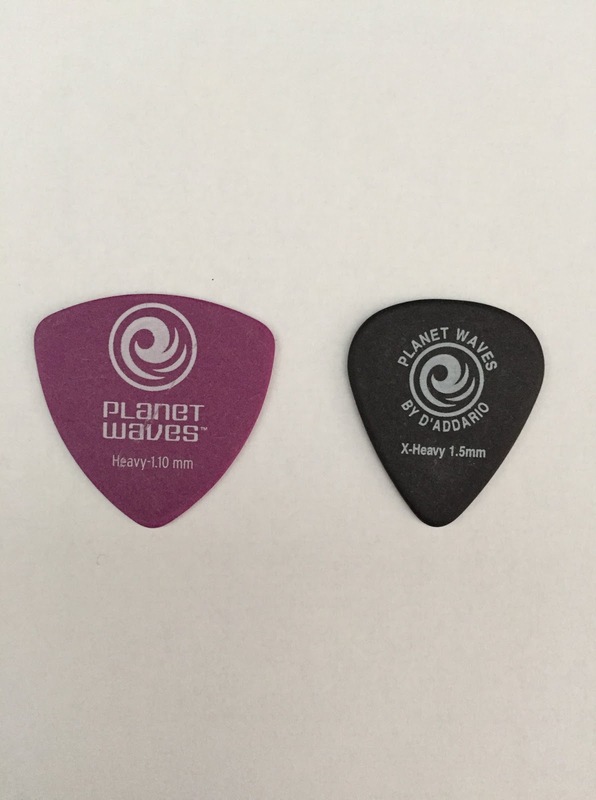 They are both availaible from Planet Waves and D´Addario - which I believe is essentially the same company. Whereas the heavy one on the left side feels and sounds ok (somewhere in the region of a Fender x-heavy celluloid), the black one (1,5mm) is a real surprise. It sounds very good, much warmer than the purple pick, with a minimum of click-noise. For me the only problem is the teardrop-shape which I do not feel as comfortable with as with the triangular shape. I contacted D´Addario and asked if there was any chance to have the black one in that shape. For reasons I cannot understand, it is not - all the other slimmer picks are available in both shapes! So if you are happy with the teardrop shape, you should really check that one out. The yellow Dunlop Ultex pick sounds way too bright for my taste with lots of click-noises. Sanding it did not help at all... maybe it is a good one if you are playing other styles than I do. Even though I did not have good experiences with wood picks before, I fell victim to the beautiful ads of Thalia, which praised their "Exotic Wood Picks" and promised a "warm tone that sounds better with each use." 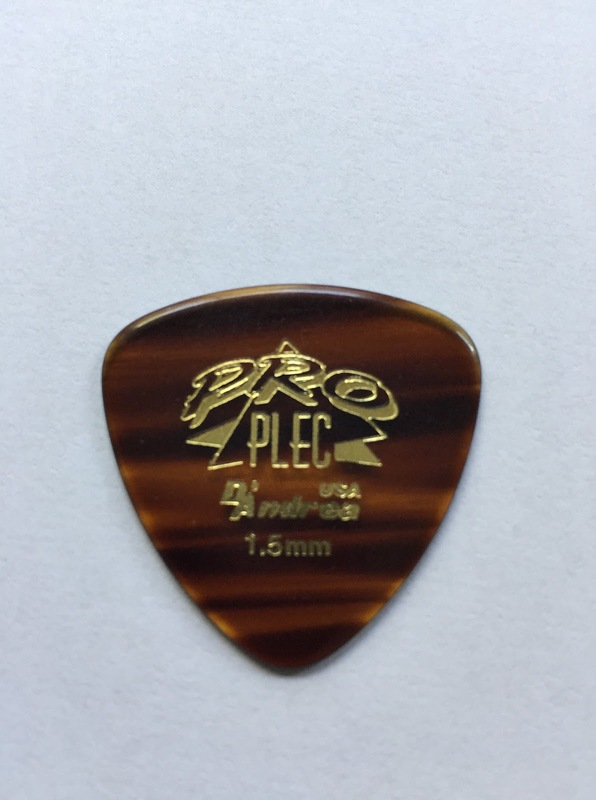 Made up of two or three layers of wood this pick produces a thin, scratchy sound that comes with excessive click noises. I even tried to make it sound better by sanding it...no way, sorry, forget it! After several friends mentioned this pick, I thought I really should try it. Hard to get - I found it nowhere in Germany and the only source seemed to be a dealer in Italy who charges 30€ for the postage alone! But I finally got it from stringsbymail.com for very little money: 10 picks for $7,90 plus $5,74 postage! And it is really great - a nice warm sound on all my guitars with very little click-noises. Even though it is not beveled or polished, it easily matches or even beats the quality of all those expensive picks I checked. In short, an exceptional pick! Manfred Junker is a Jazz-Guitarist from Konstanz, Germany. To listen to his music and read about his projects, click here. 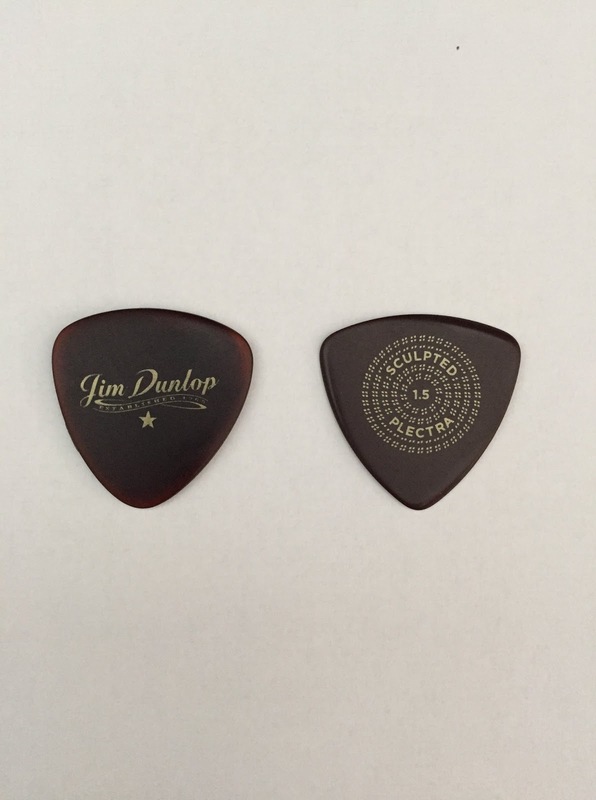 Hi there, here in Canada, I've tried the Jim Dunlop Big Stubby 3 mm that to me provides also an excellent cost-efficiency ratio! Specially great with my Gypsy jazz guitar.